Oakland is planning new bike lanes on the streets listed below but there is still a lot of work to do in order to make this happen. First, the City is finalizing the land use components of the plan, which are important in order to achieve walkable and bikeable neighborhoods. The bikeway designs are in good shape for all of these streets, except the core blocks within the heart of Chinatown, where the Chinatown Chamber of Commerce is resisting our efforts for safe bikeways. We need help building community support for these important bike connections. If you can help, please contact: Dave Campbell, EBBC Advocacy Director. Our friends at TransForm has been taking the lead for the land use plan for the area surrounding Lake Merritt BART station that helps make the neighborhood more walkable and bikeable, while including enough affordable housing to preserve and support the incredibly diverse community living in downtown Oakland. The City is getting close to a final plan, which is being reviewed in committee meetings of the Oakland Planning Commission in April. Come show your support for these goals at the Design Review Committee on Wednesday, April 3, 2013 at 4:00 p.m. at Oakland City Hall. Another hearing focused on zoning updates is being rescheduled for mid-April – we’ll post it on our events calendar when we know the new date, or contact Joël Ramos for more ways to get involved. February 4, 2012 Update: Oakland City Staff will be presenting the Draft Preferred Plan in a series of public hearings, highlighting points of consensus and responding to key outstanding issues. The Draft Preferred Plan begins to articulate land use and open space policies; affordable housing strategies; circulation and streetscape plans; and building height and massing proposals. These initial concepts will be refined and adjusted to form the basis for more specific policies, projects and regulations that will be included in the Lake Merritt Station Area Plan. The Lake Merritt Station Area Plan will build on the area’s existing vibrancy and potential catalyst development projects, to establish a coordinated vision for new development, transportation and open space improvements over the next 25 years. The Draft Preferred Plan may be viewed on the project website (under the “Reports” section at www.business2oakland.com/lakemerrittsap), at the offices of the City of Oakland Strategic Planning Division (250 Frank H. Ogawa Plaza, Suite 3315), the Oakland Asian Cultural Center (388 9th Street) and at the Lincoln Square Recreation Center (250 10th Street). Tell the City of Oakland that you support bike lanes on 8th & 9th Streets through Chinatown This is a real opportunity to make Oakland a truly bikeable city with streets that are safe and inviting for bicyclists of all ages and abilities. Good bicycling is good for business. Studies show that bicyclists shop more than drivers because they shop more often. They also provide eyes on the street and make the streets safer for pedestrians, shoppers, and everyone, particularly at night. EBBC staff and many interested members heard a presentation from the City of Oakland on their intial bikeway ideas at the August 18 Oakland Bicycle & Pedestrian Advisory Committee. On Sept 12, many supporters of bike lanes turned out to a public open house at Laney College to view designs for the bike lanes and provide feedback. The EBBC submitted formal comments thanking the City for proposing bike lanes on Madison & Oak Streets, 10th Street, 7th Street, and on the section of 8th and 9th Streets right at Lake Merritt BART Station. But there were no designs for bike lanes continuing on 8th and 9th Streets west through Chinatown and connecting with Broadway and Old Oakland. Your support for these bike lanes has been echoed by several community stakeholders, but some are opposed to bike lanes. No problem– our call for better bicycling just needs to be heard louder! Help make the Lake Merritt BART area a more walkable, more bikeable neighborhood and lend your voice of support by sending an email to Lake_merritt_plan@oaklandnet.com. View Needed Bike Lanes in Downtown Oakland in a larger map ￼What has the public been saying? People want to calm traffic, reduce vehicle speeds, return one-way streets back to two-way streets, widen sidewalks, encourage in-fill development, and most importantly, provide better bike access around the BART Station on 14th St, 10th St, 7th, 8th and 9th St and Oak St and Harrison St. The East Bay Bicycle Coalition and Walk Oakland Bike Oakland have been out on the streets at the Art & Soul Festival, Cannabis Festival, and Oakland Pride talking to hundreds of cyclists about the Lake Merritt BART Station Area Plan and its potential for better bikeways. Cyclists are encouraged and were eager to support our calls for bike lanes on Madison St and Oak St, and 7th, 8th, 9th, and 10th Streets, and 14th Street, among others. We will be back out on the streets at the Eat Real Festival and Rockridge Out & About talking up the Plan to cyclists who want a safer street to ride on. You can volunteer to help. Background information People who commute by bike have a real opportunity to not only create a vibrant, walkable, bikeable neighborhood around the station, but we can also complete needed gaps in Oakland’s bikeway network. 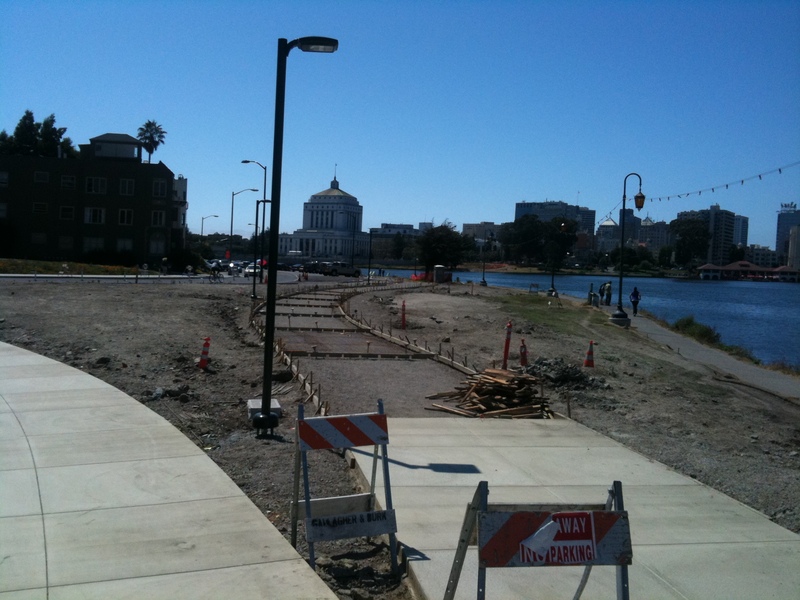 Top priority is 14th St, connecting Frank Ogawa Plaza with the new separated pathway around the bottom of Lake Merritt, and Oak St, connecting the Embarcadero with Harrison St around the west side of Lake Merritt. In addition, new bike lanes and two-way streets around Lake Merritt BART Station will get many more commuters biking to BART and help students bike to Laney College. The City of Oakland is also encouraging a lot of great new mixed-use development around the station, including a mix of shopping, restaurants, office, entertainment and residential uses throughout the area that are affordable for a wide range of incomes. The Bicycle Coalition will continue to work with the City to ensure that good bike circulation is a top priority. Next steps are to finalize designs for the Plan and then to prioritize which projects get funded first. Since bike projects do not cost much money, we can make sure they stay a top priority. We need your help to ensure lots of public support. Learn more about the project at: Lake Merritt BART Station Area Plan If you live or work in the area, or have a good contact with a local business that would be supportive of bike lanes, please contact Dave Campbell, East Bay Bicycle Coalition Program Director to stay informed about the Plan and help the Bicycle Coalition make the streets safe for cycling around Lake Merritt BART.